Ms. Celiac Says...: Raising Your Dog Gluten Free? If your dog has been diagnosed with Celiac Disease then they need to be on a gluten free diet, but perhaps if your dog has some other health problems he or she may also benefit from this diet. My 13 year old American Cocker Spaniel, Mutsy, started having skin problems a little over a year ago. Her skin would itch so badly that she would chew and scratch herself until she bled. She visited many veterinarians and tried many different treatments to cure this problem, but nothing worked. I decided to start her on a complete allergy free diet, eliminating everything from gluten to chicken. Within 2 weeks, she stopped itching completely! Her skin is healing now and the fur she lost over the spots she gnawed away at is starting to grow back! Recently, a new gluten free dog food was brought onto the market. 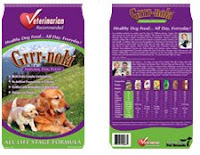 It is produced by the All American Pet Company and is called, Grrr-nola Natural Dog Food. In addition to being gluten free it is supplemented with vitamins and omega 3 and 6 fatty acids. Also, talk to your vet about other limited ingredient diet options for your dog.